A world-class resort hotel is now being constructed in Baler Aurora Philippines to cater to the growing local tourism industry in the province. Named Costa Pacifica, the three-storey hotel with 78 rooms is located at a three-hectare site in Barangay Sabang, a favorite surfing destination of local and foreign tourists. It is being built by the internationally acclaimed Raintree Company, a known builder of several high-end hotels and restaurants, food courts and food parks in the country. Raintree president Annabella Wisniewski recently briefed Senator Edgardo J. Angara about the project, together with Raeana Cranbourne, who is the firm’s project director. Wisniewski said the hotel will have a restaurant and cafeteria where meetings, conferences and socials can be held. It will be completed in December 2012, with a soft opening a month earlier. “This type of hotel is appropriate for Filipino hospitality. It’s a terrific industry because Filipinos are naturally hospitable. 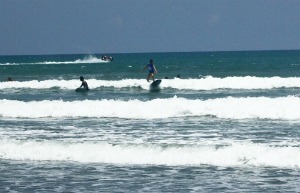 The project will also give many attributes to ehe tourism industry in Baler Aurora Philippines,” Wisniewski said. She said a prominent architect Ed Calma designed the hotel which construction has already generated 150 local jobs. Wisniewski said their firm decided to build a world-class hotel in this capital town to cash in on the booming tourism industry and to spur countryside development. “Besides, we want to showcase the beauty of Baler as a premier tourist destination and tourism can generate a lot of revenues,” she said. “The hotel facility they are putting up in the province is very accessible from Manila and is located in the only beach area surrounded by the land-locked provinces of Nueva Ecija and Nueva Vizcaya,” she said, adding that her firm is also taking care of the renovation of the adjacent Bahia 1 and Bahia 2 hotels which have a total of 33 rooms. Angara said his sister Governor Bellaflor Angara-Castillo is working on having the area near the chain of hotels turned into a tourism enterprise zone, the tourism equivalent of a special economic zone with tax incentives for locators in Baler Aurora Philippines. As a tourism enterprise zone, it will get state funding from the Tourism Industry and Enterprise Zone Authority (TIEZA) which will construct building, access road, water systems and related facilities. The establishment of the hotel is expected to boost tourist arrivals in the province which registered a 300-percent jump over the last five years. Provincial Tourism Office (PTO) records showed that visitor arrivals in the province reached a record-high of 68,395 in 2010 from a measly 11,534 in 2006.